Jim Gottuso was born in central New York and moved to Kentucky at the age of 19 to attend Murray State University where he received his BFA in ceramics and drawing. He attended the University of Montana and worked with Rudy Autio. After making a decision to change schools, Jim transferred to Southern Illinois University in Carbondale where he received his MFA in sculpture while working with Tom Walsh. Jim moved to Louisville, KY where he founded two successful businesses, one in video animation and the other in internet development. He also worked as a graphic designer and as a fine woodworker. This design background is evident in the graphic nature of his work. As time past and the economy changed, his desire to return to the studio grew and he started to collect the equipment needed to start a small studio practice. Thirteen years ago he learned that he would soon be a father. This discovery was the final impetus to pursue clay as a full time studio potter. With fatherhood on the horizon, he understood that if he was going to be a working artist that he had to make the leap of faith. This was the best decision of his life, risky as it was. This commitment allowed him to home school his daughter while working from his home studio. He found the unique balance of studio, teacher and father suited him. One of the earliest bloggers in the clay community, his wry sense of humor and storytelling introduced many to his work. The blog was a way for artists and customers to have access to his working process. With social media, there is a now a more immediate, frequent, and visual way to follow his work. His current work combines wheel thrown forms and sculptural elements. 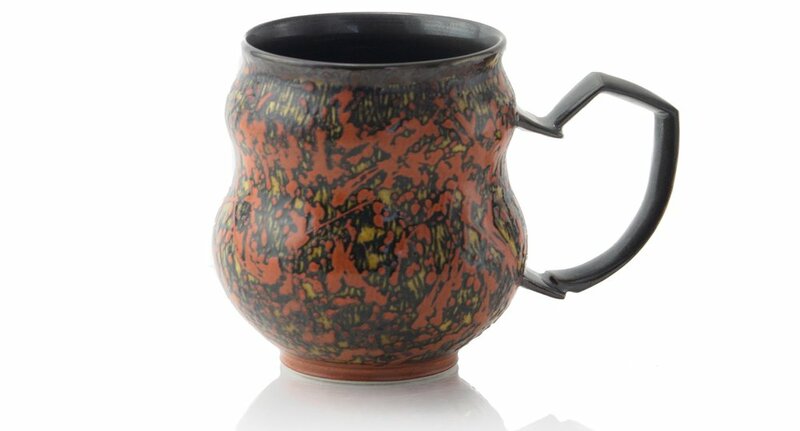 His exploration of the mug evolved from a traditional vessel toward a functional handheld sculpture, where the handle springs from the form in unique and different ways, vying for prominence in the viewer’s eye. Traditional potters believe that the best handle is one that functions and takes the least amount of time, Jim is actively turning this ideal on its head, pursuing with abandon the question of what kind of handle would you make if time was no longer a consideration. A quest for an expressive mark that was reminiscent of his undergraduate drawings led to surfaces that are covered with multiple layers of asemic writing, giving his work a kinetic energy that viewers are drawn to. This mark making eludes to the splatter paintings of Pollock and the gestural line quality of other abstract expressionist painters while also stimulating the viewer into wondering if there is a rosetta stone to decipher the hidden meanings in the script. His research into translating this mark making led to the discovering of the technique of hydro abrasion. Layers of shellac and terra sigillata are added and then a layer of clay is removed with a damp sponge between each application to create in low relief an abstracted pattern of line and color. . This unique technique is explained in better detail in this article found in Pottery Making Illustrated (June/July 2010). We are looking forward to seeing his work again at SXPF.